Every year around this time, as the old year wanes and the new year looms, I allow myself to indulge in nostalgia. For me that takes the form of re-reading old favorites.I know that some people never re-read a book, but I've never understood that. I realize that there are books I would probably enjoy that I may never get to because I spend time re-reading. I can't, however, turn down a chance to spend time with an old friend. And that's what my favorite books are -- old and dear friends. Sometimes, when comfort is called for, an old friend is best, rather than a new and untried one.So in times of stress, I turn to favorite books for a bit of escape. The holidays are always stressful, even while they are joyous. Memories of occasions past, particularly those of loved ones who are no longer with us, are filled with happiness, but there is always that edge of sadness, too. Family and friends -- feline as well as human -- are at the forefront, but for the quiet times, a book is the answer. I must confess that I often re-read childhood favorites at such times. When I pick up a much-loved book, I always remember the thrill of discovery, the sense of wonder I felt when I delved into a story, lost myself in it, and came out on the other side, excited and sated by the experience. My parents and my beloved aunt Dottie encouraged my love of reading, and my aunt had an amazing collection of children's books, particularly mysteries, that now belongs to me. Just thinking of the characters -- or friends -- I discovered on her shelves still gives me a tiny thrill. I had never read a mystery before, and after the first one, I was hooked for life. My aunt had them all: Nancy Drew, the Hardy Boys, Judy Bolton, Cherry Ames, the Dana Girls, Trixie Belden, Ken Holt, and many others besides. One of my favorites -- and also one of aunt Dottie's -- was Veronica Thane. Veronica wasn't as well known as some of the others, but her adventures absolutely thrilled me. I have many choices of friends to revisit over the holidays when there is quiet time. I hope you have the chance to spend time with good friends, too. In The Silence of the Library, due out January 28, 2014, Charlie gets involved in the complications surrounding the author of the Veronica Thane series, and the result is murder. Miranda James will be giving away a copy of Murder Past Due, the first of the series, as part of the Season's Readings giveaway. My reading friends and I are really looking forward to Charlie's next adventure. Another series I must catch up on. 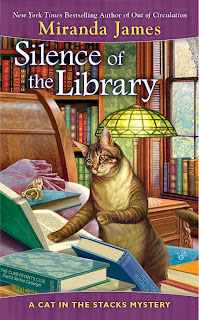 I've read the previous three Cat in the Stacks mysteries and am looking forward to the newest publication in January. I, too, enjoy rereading favorite books. Its a habit of mine to have a couple of my favorite books close at hand and to pick one up, open the book to a random page and start reading. i so enjoy the Cat in the Stacks series!!! Merry Christmas to you & yours!! Nancy Drew hooked me also. I enjoyed the jr investigators of the Alfred Hitchcock series too. My son has started to enjoy a good mystery and I am so excited to reread some of my favorites with him. I found a couple of Hardy Boys and Nancy Drew mysteries at a bazaar that I picked up to give him for Christmas. I hope he enjoys them as much as I will! I haven't had a chance to read this series yet. This series looks wonderful as I am a cat lover as well. I have always enjoyed mysteries getting hooked on Agatha Christie and Nancy Drew. My son is just starting to read mysteries and I've tried to give him some of my old YA favorites by R.L Stine, Christopher Pike and Richie Tankersley Cusick. I too loved, and still love, Nancy Drew. I haven't read any of the other mystery series you mentioned though. I reread many books over and over. The characters are old friends! And I'm looking forward to reading this series. Yes, old friends we curl up with again and again. Delightful. And the joy of sharing them with others. I've heard about all of them except for Ken Holt, and read many of them too. I don't usually reread, but I do enjoy listening to it on audiobook after having read the book - to revisit old friends. Happy Holidays! I haven't reread a book in years - my shelves are too filled with new waiting-to-be-read books! There is something wonderful about re-reading favorites. I am a Judy Bolton fan and a group of us have a contest on a book at Coudersport each year. I was 3rd this year. I love to re-read but unfortunately don't usually have enough time to do so! Happy Holidays and thanks for the giveaway! Really Good info about auto transport. I haven't read this series in many years, but I did really enjoy them. I think it is time to dust them off and maybe read some of the new ones. Looking forward to reading this series! I too have fond mystery memories! Nancy Drew and The Hardy Boys started it all for me! Nancy Drew and Cherry Ames were books I read in my youth. My mom signed me up for a book club and I got books on gems and history books as well. I'm so glad I learned to enjoy books. We still own many of our Nancy Drew, Hardy Boys and Cherry Ames books. They sit on a special shelf in the 2nd library room My eldest granddaughter is starting to look interested and the next time she stays over I'll let her choose one to read. I've been a reader all my life. I really wish that "Mommy Dearest" hadn't thrown out all my Golden Books when she remarried and we moved to his house. They'd be worth a lot today. My partner and I still own many of our childhood books, Nancy Drew, and Cherry Ames among them. I intend to share them with our grandchildren as they get old enough to enjoy them and handle them carefully. My boss collects the Bobsey Twins, but I have Vicki Barr and cherry Ames. Thank you all for taking the time to visit and leave a comment! Rachelle21 is the winner of the December 10th drawing. Please email me at miranda@catinthestacks.com with your shipping address, and I'll get the book in the mail to you. O yes, you are so right in wording this post! Some people don't understand why I re-read a series when I have so many brand new books on my shelves, waiting to be read. But it is indeed comfort, and old friends, and you just know you will have a great time. 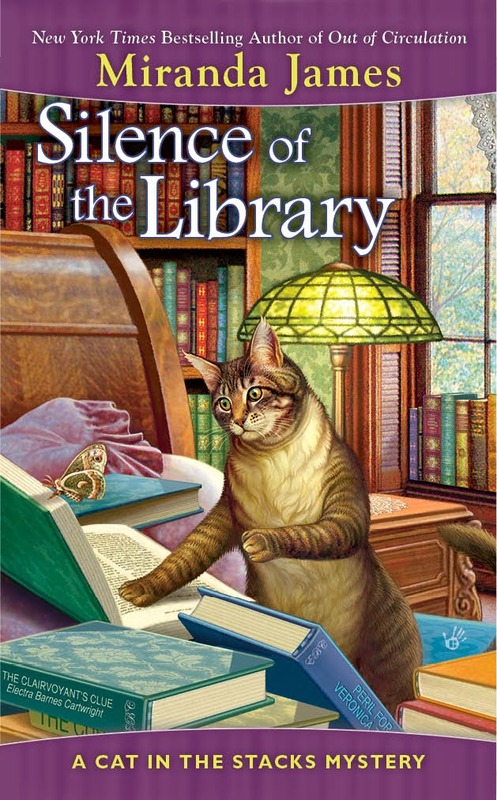 As a librarian and cozy mystery lover, as well as a cat lover, I would love to read this series. Echoing the above comment, I am a librarian and a cat lover too., The Cat in the Stacks series is probably my favorite cozy series of all. Charlie and Diesel are just terrific.